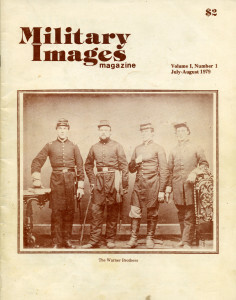 The cover image for this initial issue of Military Images is of the four Warner brothers, the subject of the focus article for the issue. It is a 6-¼ x 8 inch albumen photograph taken in 1862. Harry Roach, the editor of Military Images, welcomes readers to the magazine “devoted to preserving the photographic record of the American fighting man of the period 1839-1939.” He discussed the interests of subscribers as indicated on their subscription forms, and stressed the desire to make the magazine a reflection of the reader. Several subscribers wrote to express their enthusiasm for the publication. Others wrote to ask questions about the parameters of the images for submission and suggested topics for consideration. This article described an unusual artifact from the Great War along with two photographs of Army Field Clerk Russell Stambaugh, of the American Expeditionary Force. Stambaugh participated in a special commission in 1919 sent to Poland to investigate issues between Jews and non-Jews that were complicated by the conflict between the Polish Army and the Bolsheviks. Twelve Americans were put on this investigative commission, and were given a special service patch to wear on their uniforms. This “Polish Mission” patch, in silver bullion over crimson velvet and depicting the Polish national eagle, is shown in one of the two photographs. The Illustrated History of American Civil War Relics by Stephan W. Silvia and Michael J. O’Donnell is reviewed in this issue. The history of the British Rifle Volunteers is discussed in this article, accompanied by six different images used to illustrate descriptions of their uniforms. Many of the British Rifle Volunteers were from the middle class in Britain, and took the opportunity to have cartes de visite made of themselves in uniform. Frequently mistaken as pre-Civil War Americans or Canadians, the author goes into the history of these British soldiers and describes the variations in their uniform details. An example is a carte de visite image of a Rifle Volunteer, complete with gaiters, 1853 pattern rifle-musket, and kepi with a pompon. The author of two books on the Civil War, Military Images interviews William Frassanito on his interest in civil war photography and the planning behind his work-in-progress on the campaigns from the Wilderness to Appomattox. He shares some interesting insights on some of the photographs he has selected for inclusion, including how modern technology has pinpointed the time of day that a photograph taken of Confederate troops on September 10, 1862 in Frederick, Maryland. 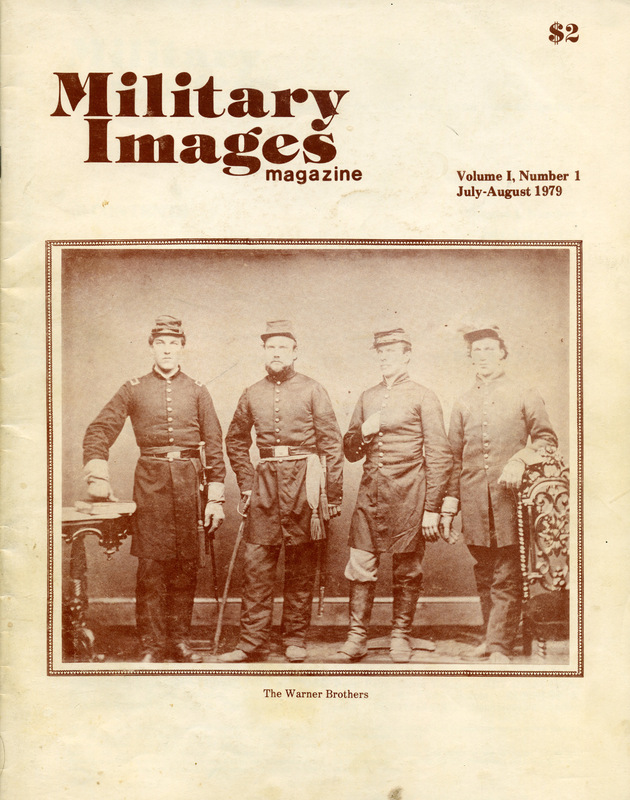 The cover story article for this issue of Military Images tells the story of four brothers from Pennsylvania who fought for the Union in the Civil War. The article follows the military careers of the four throughout the conflict, and who symbolize the typical experiences of many soldiers on both sides. One brother died, one was wounded, one was invalided out, and one survived. The article also includes documents and several other family images, including two images of Warner brothers-in-law. The collection of 23 images from Pennsylvania collector Ronn Palm displays a wide variety of individual and group images. This includes a number of Zouave images (such as the “skirmish line” from a 1/6th plate tintype), cavalry (an outdoor image of an officer and trumpeter from a 1/4 plate tintype), a carte de visite of possibly a father and two young sons all in uniform, and a casual portrait of a soldier wearing dark glasses. As this issue of Military Images was going to press, information regarding the service of a fifth (and possibly sixth) Warner brother was noted. Two images identified as “unidentified Pennsylvania National Guardsmen from the turn of the century” are shown.